LOS ANGELES - AWFS is kicking off a marketing campaign to improve the image of jobs in manufacturing and attract more young people to the wood industry. 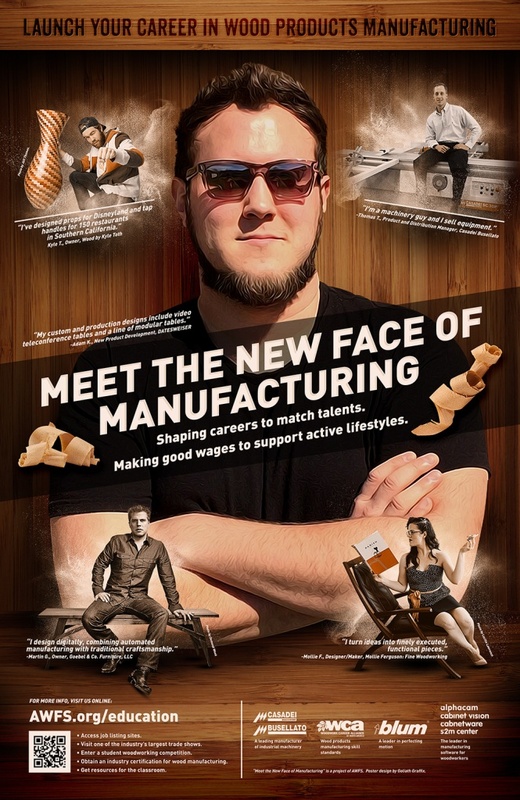 They have created a poster featuring hip young professionals currently employed in wood-related careers. The piece is intended to arrest the attention of not only students and teachers but also career counselors, parents and others who are in a position to influence students’ career choices but who may not be well-informed about the wood products manufacturing industry. The poster’s QR code leads to a page with multiple useful resources on the AWFS.org web site. Initial supporters of the campaign include Blum, Casadei Busellato, Planit and WCA. “As one of the ‘New Faces,’ my company was pleased to support this endeavor,” says Thomas Tuck, who appears on the poster. Tuck made his presence known to the wood industry when he competed in the AWFS Fresh Wood student woodworking competition as a high schooler, back in 2001. 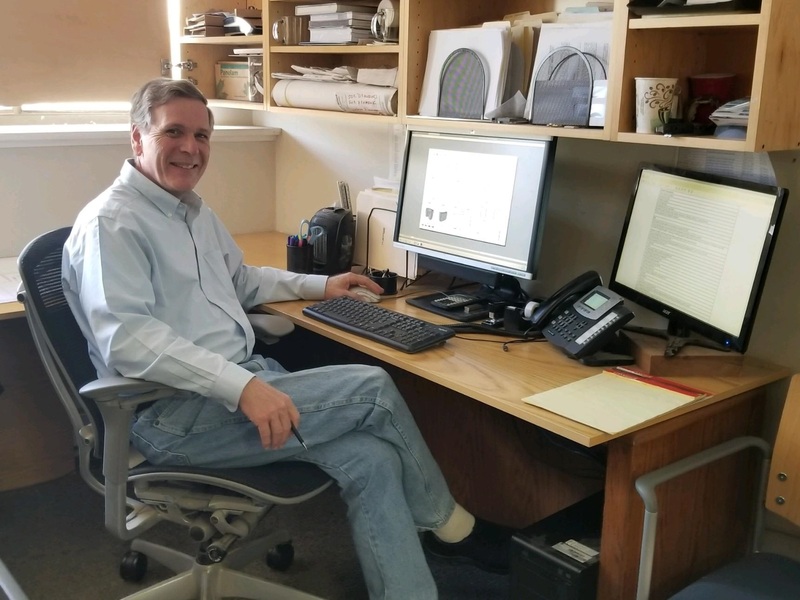 Tuck then went on to major in Furniture Studies at Appalachian State University, intern with AWFS, and began his career as Marketing Coordinator for SCM Group. He currently is the Product and Distribution Manager for Casadei Busellato. Other AWFS efforts aimed at closing the gap between industry and education are a series of guidelines AWFS developed to help companies reach out to students and schools on their own. “The shortage of workers that all of manufacturing faces will not solve itself,” says Hershberger. “The industry as a whole needs to become pro-active in finding and cultivating the help they need." The guidelines are designed to assist companies in setting up an internship program in their company; inviting a teacher into one’s company for a short course on industry practices which the teacher can then take back and incorporate into the curriculum; how to prepare and deliver a presentation in the classroom; and offering a school tour of your company. All the guidelines and forms were created in word documents so they can be customized to suit any business’ needs. “Once we come to grips with the fact that we have to dedicate time and staff to developing our own workforce, that we have to budget for it, we will be on our way. It won’t be easy but it will pay off,” says sponsor, Brian Joyce of Blum Inc. “Blum runs its own apprenticeship program in North Carolina awarding highly coveted spots to graduating high school seniors. AWFS is on the right path in stimulating awareness of our industry with the schools and general public.” AWFS intends to create additional images and general interest stories in the ongoing campaign, as well as create a photo shoot at the 2015 AWFS Fair. Any company in the wood industry can submit photos for potential use in the campaign. Images of young professionals should match the spirit of the “New Faces” campaign. Photos can be submitted to nancy@awfs.org. AWFS is kicking off a marketing campaign to improve the image of jobs in manufacturing and attract more young people to the wood industry. They have created a poster featuring hip young professionals currently employed in wood-related careers. The piece is intended to arrest the attention of not only students and teachers but also career counselors, parents and others who are in a position to influence students’ career choices but who may not be well-informed about the wood products manufacturing industry. The poster’s QR code leads to a page with multiple useful resources on the AWFS.org web site. Other AWFS efforts aimed at closing the gap between industry and education are a series of guidelines AWFS developed to help companies reach out to students and schools on their own. “The shortage of workers that all of manufacturing faces will not solve itself,” says Hershberger. “The industry as a whole needs to become pro-active in finding and cultivating the help they need. “ The guidelines are designed to assist companies in setting up an internship program in their company; inviting a teacher into one’s company for a short course on industry practices which the teacher can then take back and incorporate into the curriculum; how to prepare and deliver a presentation in the classroom; and offering a school tour of your company. All the guidelines and forms were created in word documents so they can be customized to suit any business’ needs. “Once we come to grips with the fact that we have to dedicate time and staff to developing our own workforce, that we have to budget for it, we will be on our way. It won’t be easy but it will pay off,” says sponsor, Brian Joyce of Blum Inc. “Blum runs its own apprenticeship program in North Carolina awarding highly coveted spots to graduating high school seniors. AWFS is on the right path in stimulating awareness of our industry with the schools and general public.” AWFS intends to create additional images and general interest stories in the ongoing campaign, as well as create a photo shoot at the 2015 AWFS Fair. Any company in the wood industry can submit photos for potential use in the campaign. Images of young professionals should match the spirit of the “New Faces” campaign. Photos can be submitted to nancy@awfs.org.